Of course, I am not the first to do so. I encourage to check out the documentation, as well as excellent posts from Adrian Billington (search for "table functions") and Tim Hall. Adrian and Tim mostly focus on pipelined table functions, a specialized variant of table functions designed to improve performance and reduce PGA consumption. 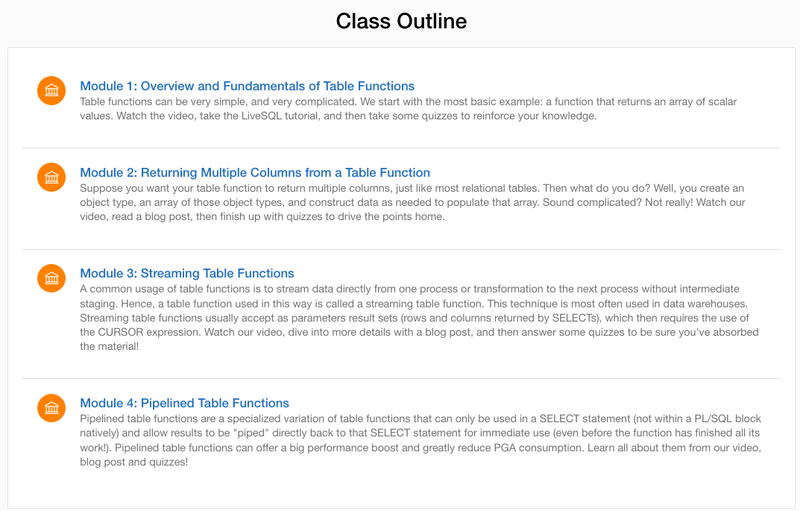 I will take a look at pipelined table functions in the latter part of this series. 1. I will start (in this post) with some very simple examples and exploration of a few use cases. 2. Explore table functions that return more than one value per row (via object types). 3. Take a look at how the PL/SQL Challenge uses table functions to avoid code redundancy and minimize the number of interactive reports needed to provide rankings. 4. Streaming table functions: these kinds of table functions are used typically in data warehousing environments, in which one or more transformations of data are needed all "streamed" within a single SQL statement. 5. Pipelined table functions: how they differ from non-pipelined, what they look like, why you would use them. 6. Optimizing execution of table functions: it helps to provide the cost-based optimizer with some additional information so that it can come up with the best plan. Which means you can emulate a "parameterized view", since you can pass values to the function's parameter list) based on a TABLE operator. This way, the dataset returned by the table function is determined by values passed to the function at run-time, rather than at the time a view built around the table function was created. 'cause at that point, it (the dataset returned by a table function) is just the same as the dataset from a table or view. You can use ORDER BY, GROUP BY, etc. on the data returned from the function. Prior to Oracle Database 12c Release 1, only nested tables and varrays could be consumed by the TABLE operator, and their types had to be defined at the schema level (CREATE TYPE) or in a package specification. In 12.1 and higher, you can also use TABLE with integer-indexed associative arrays (also known as "IBIs" because of their INDEX BY clauses), one of my favorite 12.1 enhancements for PL/SQL. I am hoping that your eyes lit up at even the most basic presentation of this feature above, and your mind is spinning with ideas of how to use table functions. To help you along, though, I offer the following list, all of which will be explored as we move through this series. You've got data, and lots of it sitting in tables. But in your session (and not in any tables), you have some data - and you need to "merge" these two sources together in an SQL statement. In other words, you need the set-oriented power of SQL to get some answers. With the TABLE operator, you can accomplish precisely that. Your webpage needs to display some data in a nice neat report. That data is, however, far from neat. In fact, you need to execute procedural code to construct the dataset. Sure, you could construct the data, insert into a table, and then SELECT from the table. But with a table function, you can deliver that data immediately to the webpage, without any need for non-query DML. One of my favorites, and arises (for me) directly from my work on the PL/SQL Challenge. We have lots of different ranking reports, based on different materialized views (but all very similar in their columns and the way the data is computed). Used to be, we created something like 25 different interactive reports in Application Express. Then, when facing the need to enhance each and every one of those, we stepped back and looked for ways to avoid this repetitive mess. The answer lay in a table function. Since you call a function in the FROM clause, you can pass parameters to the function and therefore to the query itself. That flexibility made it possible to replace those 25 different reports with just 1 report, built on that "parameterized view." Many data warehouse applications rely on Parallel Query to greatly improve performance of massive ETL operations. But if you execute a table function in the FROM clause, that query will serialize (blocked by the call to the function). Unless, unless....you define that function a a pipelined function and enable it for parallel execution. Collections (which are constructed and returned by "normal" table functions) can consume an awful lot of PGA (Process Global Area). But if you define that table function as pipelined, PGA consumption becomes a non-issue. Do you know of others? Tell me in a comment on the post and I will add them to this post and give you credit (of course)! I will close out this initial post of the series with some examples of the simplest sort of table functions: those that return a collection of scalar values - a list of strings, dates, numbers, etc. And then....I can SELECT FROM that function! Note that when you return a collection of scalars, Oracle automatically uses "COLUMN_VALUE" for the name of the column. You can change it to whatever you'd like with a column alias. I am not, by the way, claiming that the last example makes any sense. Just showing that you can do it. And there you have it: a quick introduction, description of (some) use case, and a set of simple examples. Next in series: Explore table functions that return more than one value per row (via object types). Suggestions for improvement? Let 'em rip! And if you'd like to dive right in to more interesting examples, download my demo.zip and check out the files starting with "tabfunc". a collection type inside the TABLE() operator. Instead, we should create a local collection variable and assign to it the result of the function, and then use that local variable as argument for the TABLE() operator. Or, maybe I am missing something ? Many thanks, Iudith. Yes, you are correct and I have applied that correction to the post. Thanks for your close reading and encyclopedic memory of the PL/SQL Challenge quizzes (plsqlchallenge.com). You can get around the issue of "as of 12.1, you cannot call the table function directly inside the TABLE operator", and also use a table function with a package-declared type in 11g by using the PIPELINED functionality. Craig, formally you got around this restriction but at what cost? You ended up with a function that is declared as pipelined but isn't pipelined by nature. Thanks, Craig. Great point! Yes, it is true, that even before 12.1, you could use package-based collection types - but only with pipelined table functions. A pipelined table function is a special type of table function and generally people blur the distinction between the two. And there are tradeoffs - one example: a "normal" TF can be called in FROM clause as well as in PL/SQL block. A pipelined TF can ONLY be called inside FROM clause. based on a pattern that includes the object_id of the package, for supporting the pipelined function. his own schema level collection types for supporting pipelined functions. which is exactly the opposite of the case of a pipelined function. "In SQL contexts, you cannot use a function whose return type was declared in a package specification." "to close these gaps", and make everything fully compatible between the two contexts. Hi Steven, they're incredibly useful tools. I used pipelined table functions to dynamically (or rather, programmatically) mutate my reporting data model to group by any given time frame and allow time period comparison across any pair of user-specified date ranges in OBIEE - something that is extremely difficult against a regular data warehouse star schema. The map-reduce pattern is also a really interesting use case, but I haven't look into it any further than a basic keyword analysis of message transcripts. @Phil Wilkinson That's an interesting use-case. I would be interested to read more about this and how you went about implementing in OBIEE. One of the issues with TABLE operator is inability to get collection element index value. Therefore we can't get guaranteed TABLE operator results in collection element order. I placed enhancement request to add COLUMN_INDEX pseudo column as COLUMN_VALUE counterpart. This was when TABLE operator was called THE and Oracle didn't have XML support. Since then Oracle added XML support which (yes, it is XML standard) supports FOR ORDINALITY to get "index" value however no index in TABLE operator. that would become broken if this rule was violated. For pipelined functions this seems pretty obvious. Though, of course, since this feature is not documented, we cannot rely on it 100%. you can order the results using an ORDER BY in any way you wish. the collection can be created as a collection of objects, with one object attribute containing the original index value. Can you please explain what do you mean by "that as of 12.1, you cannot call the tables function directly inside the TABLE operator. You must invoke it in PL/SQL, assign result to a variable, and then reference the variable inside TABLE" ? As per my undetanding we are doing the same thing by using the query select column_value from table(my_function()) in the very first example. Please correct me where my mistake is in understandingthe concept ? So that example demonstrates syntax you can use with a nested table or varray, but not (yet) with an associative array. "Starting with 12.1, you can also define a collection type returned by a table function in a package specification, and then reference that collection inside a TABLE operator:"
Alex, yes, as discussed in other comments (and now clarified with a note on that sentence), this is possible prior to 12.2, but only for pipelined table functions. If you have an example demonstrating otherwise, please do share. And thanks for writing! XMLTABLE ('$d/employee' passing column_value as "d"
they hold the data in an object type.if i used them to fetch the data in plsql table in 12c,where are this data hold? Mostafa, with pipelined functions you do not use PGA memory to construct and pass back the array. You will, however, still be using SOME memory for the individual rows piped back (usually an object type instance). But the amount will be much, MUCH smaller and likely not something to worry about - at least in terms of session memory errors. Hope that helps, thanks for writing! But excuse me,i still can not see the difference between two cases. first case:- I declared a PL-SQL table and fetched a set of emp data in it using cursor with bulk collect keyword. Second case:= I did the same with the declared PL-SQL table but with using pipelined functions(12c) . Finally i have a PL-SQL table that hold a set emp data -that passed to it with two different ways-. that received the same data with two different ways. I wish i could explained well in my post. Ah, I think I see your point and why we are "talking past" each other a bit. If you call the pipelined table function (PTF) inside a PL/SQL block, and each row that is returned by the PTF is put into a collection...you are right. In the end, you will have used roughly the same amount of PGA. In contrast to non-pipelined TFs, PTFs can ONLY be executed from within a query. Generally the idea with PTFs is to deliver data to a host environment that is NOT PL/SQL, for example, a web page or other user-facing element. Minnu, first, the standard reply: "giving error" - what error, what code did you actually try to run? Did you try to isolate the error? So I'm an Oracle newbie with a number of years of MS SQL Server experience. I can't shake the feeling that this is one of many examples where the Oracle powers that be decided to make things way more complicated than necessary. I keep trying to think of a justification for the extra complexity in Oracle (creating types, schema vs. package types, pipeline, etc.) and I'm struggling to find any. And yes of course I realize "Oracle isn't SQL Server". I guess I'm just looking for some context from an insider. Thanks! Not quite sure what to tell you, Anthony. Yes, without a doubt there are elements of T-SQL syntax that are simpler than PL/SQL's. And there are many features in PL/SQL which do not appear in T-SQL (packages, for example). I imagine that members of the PL/SQL dev team (of which I am not) would argue that PL/SQL is much more and more consistently structured. Sometimes the result is a bit more "complexity" than a corresponding T-SQL operations. Sometimes the result is an elegant and simple syntax. For example, the RESULT_CACHE feature. I don't always agree or like the path taken in terms of PL/SQL syntax, but I sure respect the deep and thorough attention they give to adding new features and syntax to the language. Thanks Steven, I appreciate the reply. I've certainly had a few "Oh nice! I wish I could have done this in T-SQL!" moments, along with a number of "Come on, really!? I miss T-SQL." moments. That said, your articles and videos have proven to be immensely helpful and insightful. I owe you thanks for that as well! I created a Table Function, based of a simple Select Query. The Function gets Executed, how ever it returns a Null or Empty Structure as Output i.e I can see the Expected Record Count in my case 10, but all the Rows are Empty or NULL. Anand, you are extending the nested table inside your loop, but you never actually assign any values to the newly created element. For example: dataoupt(dataoupt.last).mgr := i.mgr. If you do that, then you should see data in the array and in the select from the function.